Our Horseshoeing School has been pioneering new methods and research for over 30 years. As one of the top schools in the country, we offer training that can't be found anywhere else. The Treadmill helps students learn the Most about shoeing by studying the horse in motion. Our patented Treadmill is the only one of it's kind in the nation! The farrier who knows more earns more!! Before, during and after shoeing. It's not enough to learn how to apply a shoe. You must learn how the shoe effects motion. The more you LEARN, the more you'll EARN!! The Adustable Shoe, invented here, helps you understand more than many experienced shoers! Watch the motion of the horse. Alter the motion of the horse (for studies only). This gives great insight for the student!! Thermal Imaging allows you to quickly learn the advantages of using modern technology. 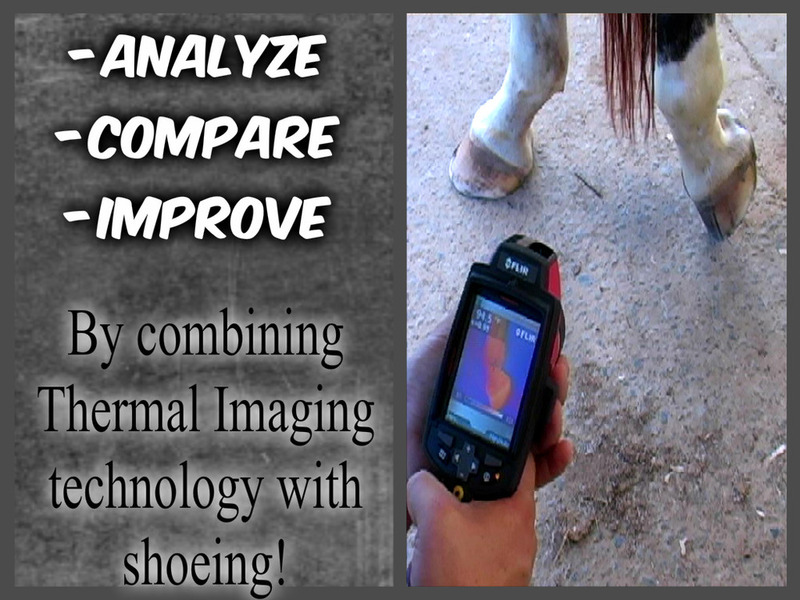 We've added thermography to our arsenal to show you the effects of shoeing from the inside out. We have the latest tools to help you succeed. Don't get left behind. FLIR thermal imaging systems use state-of-the-art infrared imaging technology that detects heat. The CaseyCam and Track can ONLY be found at OUR SCHOOL! The track was invented Here in 1989. See what the eye cannot! The EFT course is included in Tuition Fees of the Horseshoeing III and the Horseshoeing IV Courses only at the Casey & Son Horseshoeing School at the Farriers’ National Research Center !! It allows us to study diseases and to understand how the use of various soaking solutions can affect the horse's foot. "Six Steps to Balancing the Horse and Hoof for Sound Shoeing"
Less classroom & study time! Become a Well Trained, Well Paid Pro in Less Time! We explain our Six Step method in the"The Grammar School of Trimming and Shoeing Horses" DVD. Learn more here.